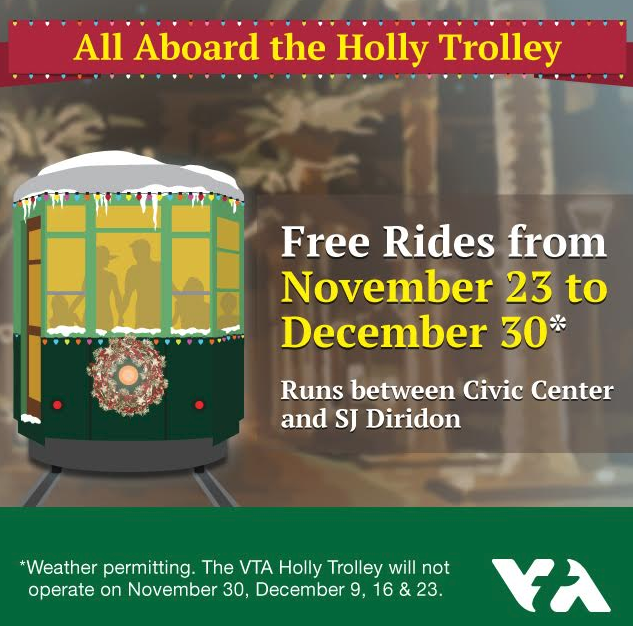 The San Jose Blog: VTA's Holly Trolley is back for the holidays! VTA's Holly Trolley is back for the holidays! VTA has a special historic train all decked out for the holidays that loops around Downtown San Jose. The train runs on Fridays, Saturdays, and Sundays from November 23rd to December 30th. It runs on the Light Rail tracks between the Civic Center and Diridon Station and is completely free. It is worth seeking out if you are visiting Christmas in the Park, Downtown Ice, or any other Downtown holiday attraction. For a timetable, click here.